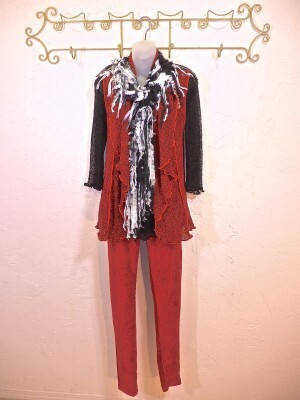 Red long Knit Vest - 99. Red Handmade Fringe Shawl - 199. Angle Stripped Knit Tunic - 89. Grey Knit Poncho - 59. Light Grey Layered Knit Tp - 79. 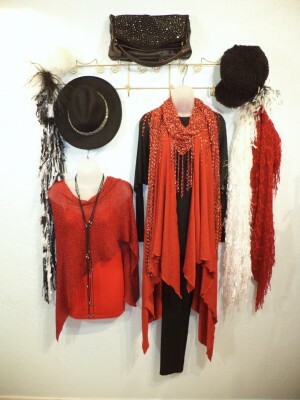 Red Knit Cape w/black trim - 99. Red Handmade Ribbon Boa - 129. Black Suede Boots w/crystals - 139. Black Knit Layered Top - 79. Red Knit Vest - 89. Original Handmade Black/White Ribbon Boa - 129. 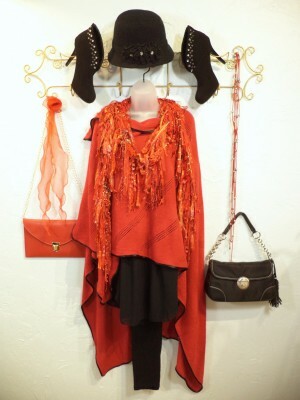 Red & Black Knit Poncho - 59. Coral Loose Weave Knit Cardigan - 129. 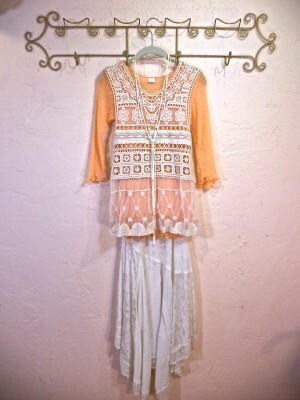 Coral Knit Tunic w/Lace - 99. Coral Border Long Vest - 99.SOLD! Coral Knit Layered Top - 79. 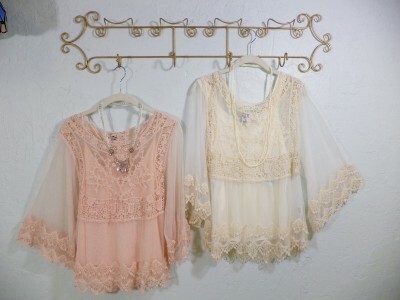 Peach Dolman Top - 69. Peach Maxi Skirt - 89. 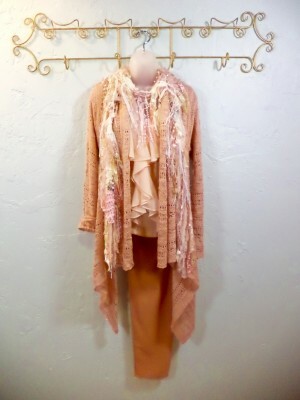 Peach Knit Cardigan w/Lace - 129.SOLD!. Embroidered Brown Boots - 149. 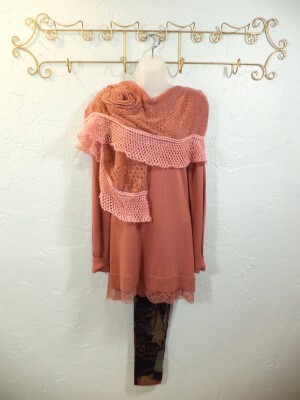 Coral Knit Tunic w/Lace - 99.SOLD! Coral 2-tone Knit Scarf - 89. 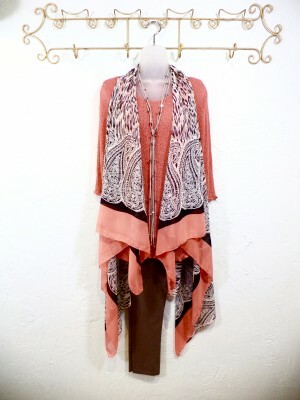 Coral Fringe Shawl - 119. Multi-Colored Soft Leggings - 69. Coral Knit Cardigan - 129. Handmade Multi Coral/Peach Ribbon Boa - 129. 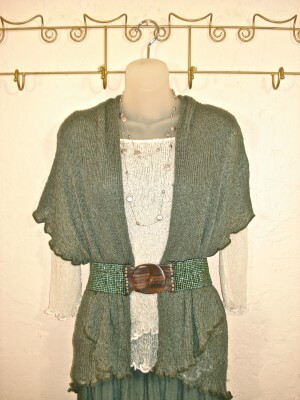 Long Copper Knit Cardigan - 129. Wool Fedora w/Silver metal decorative band - 89. Peach Layered Knit Top - 79. Long Ivory Maxi Skirt 139. 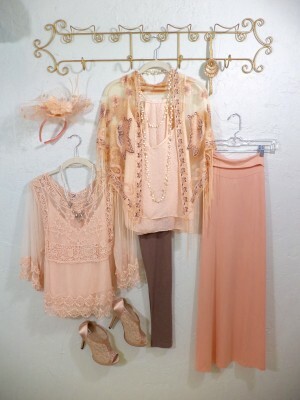 Peach or Ivory Lacy Cami - 99. Ivory Layered Top - 79. Ivory Lacy Bolero - 79. Ivory Handmade Ribbon Boa - 129. Blush Knit Poncho - 59. Long White Knit Vest - 89. Med. 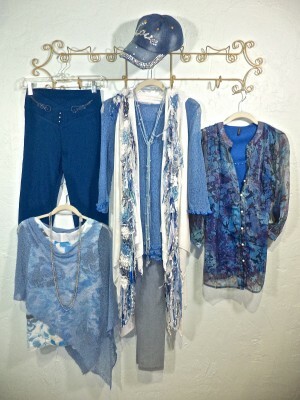 Blue Knit Layered Top - 79. Handmade Blue & White Ribbon Boa - 129. 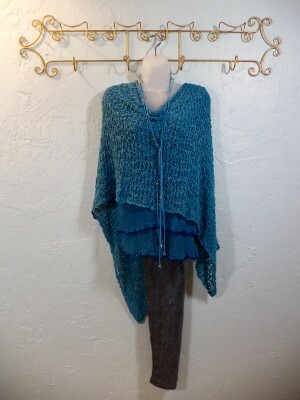 Aqua Knit Poncho - 59. Handmade Aqua/Teal Ribbon Boa - 129. Blush/Navy Long Vest - 99. SOLD! Ivory Lace Dress - 169.SOLD! 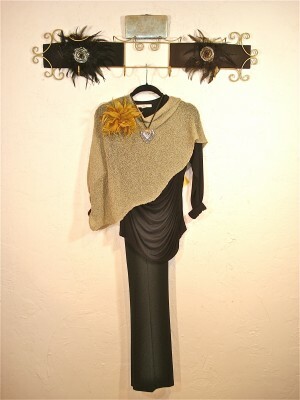 Gold Knit Shrug - 79. 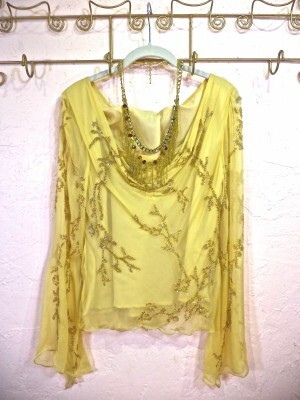 Gold Silk Sequin Blouse - 129.SOLD! Tan Knit Poncho - 59. 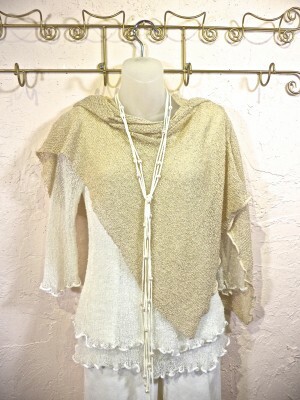 Ivory Layered Knit Top - 79. Suede Lariat w/crystals - 119. 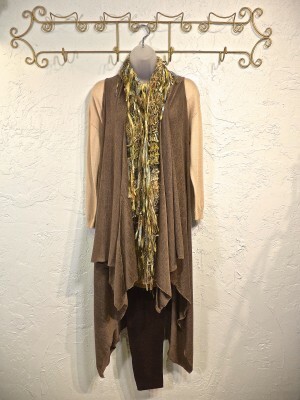 Soft Taupe Multi Cape - 129.ON SALE! 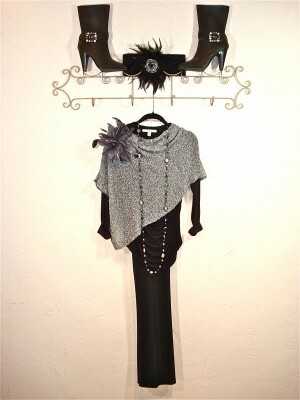 Elegant Cape w/lurex - 129. Tall Taupe Boots - 149. 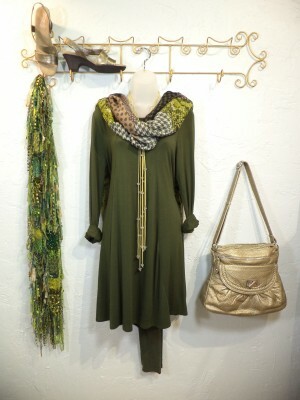 Olive Knit Tunic - 89. 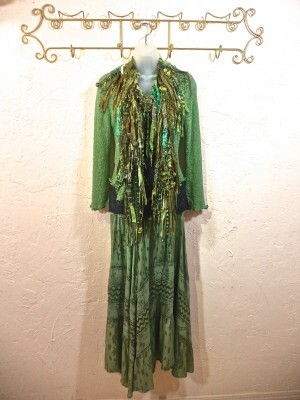 Multi Green Ribbon Boa - 129. 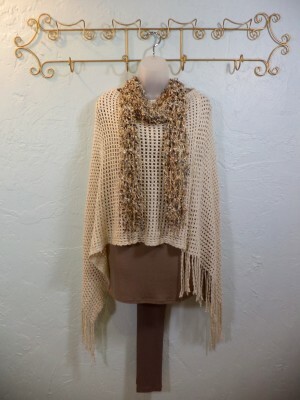 Tan Knit Poncho - 99. 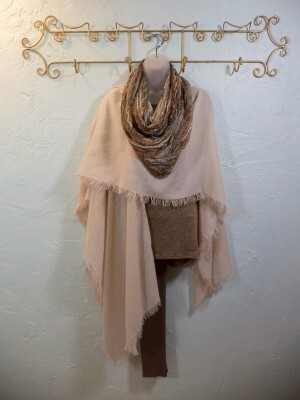 Multi tan/brown nettled Scarf - 69. Long Navy Knit Vest - 129. 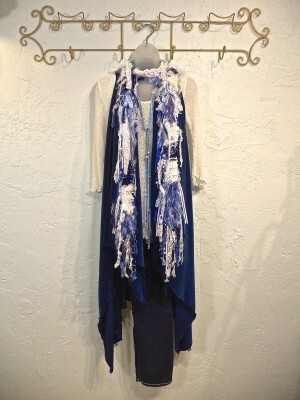 Handmade Blues & White Ribbon Boa - 129. 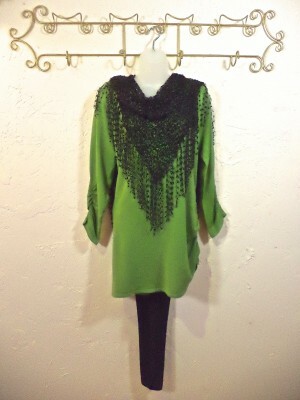 Green Knit Tunic - 99. 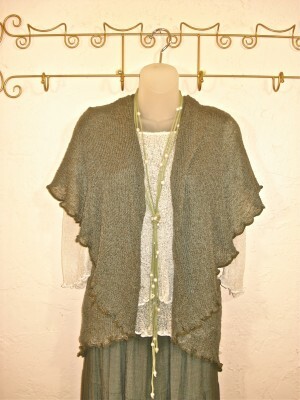 Handmade Greens & Black Fringe Shawl - 199. Handmade Black & White Ribbon Shawl - 299. 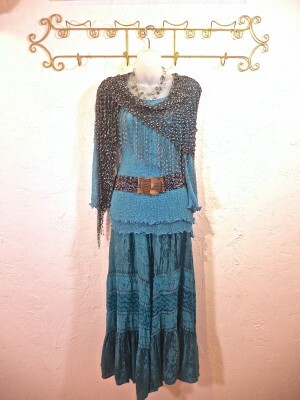 Handmade Turquoise & Blues Ribbon Shawi - 299. 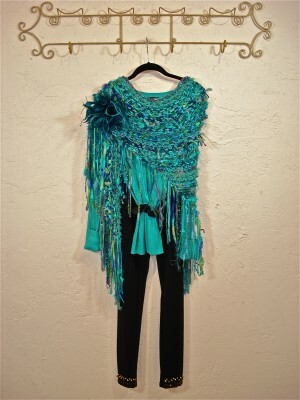 Turquoise Knit Poncho - 59. Black Boots w/turq. and crystal stone inlay - 149. 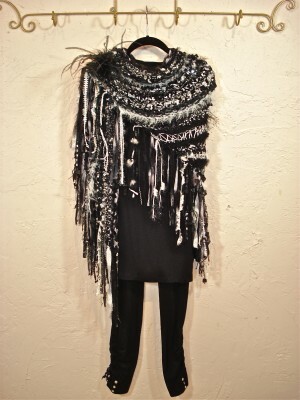 Black & White Knit Poncho - 59. 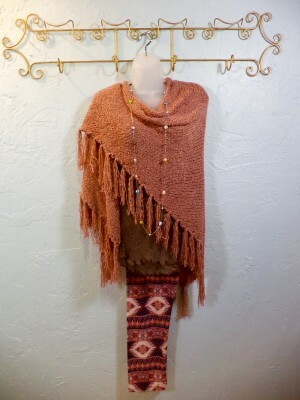 Blush Cape w/Fringe - 129. 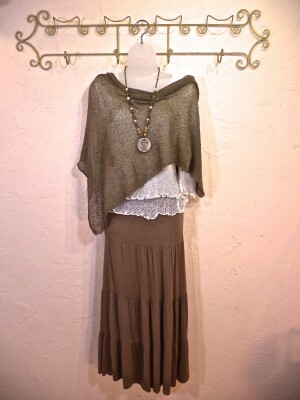 Taupe Knit Tunic - 69. Taupe Knit Leggings - 59. Tan Multi Infinity Scarf - 69. 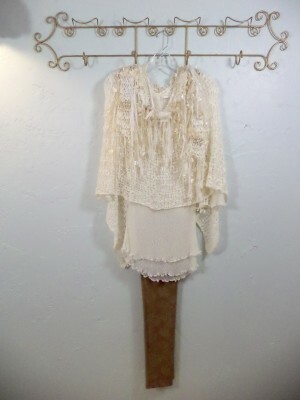 Ivory Knit Poncho w/Fringe - 129. 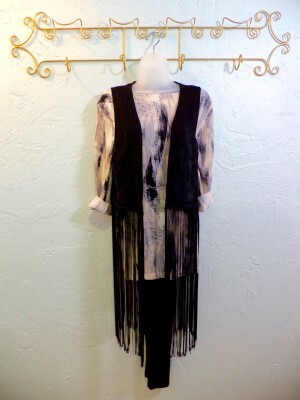 Black long Fringe Vest - 99. Multi. Gray/Black Tunic - 59. Tangerine Knit Layered Top - 79. Multi.-print Swing Cardigan - 99. 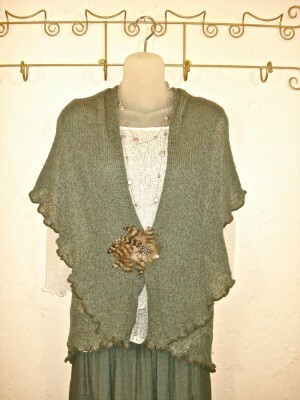 Teal Knit Popcorn Poncho - 79. Teal Layered Knit Top - 79. Teal Suede Crystal Lariat - 119. 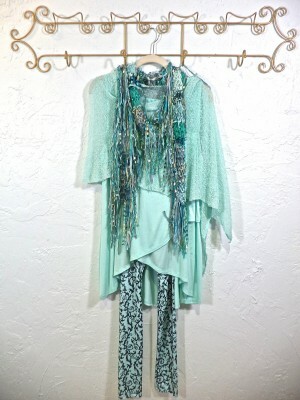 Teal Knit Layered Top - 79. Teal Maxi Skirt - 139. 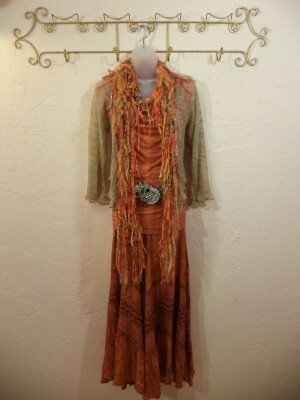 Handmade Fringe Multi-colored Shawl - 199. Long Navy Knit Vest - 99. White Layered Top - 79. Burnout Lace Black & White Dress - 229. Handmade Black Shawl with Silver Lurex 0 199. Green Embroidered Maxi Dress - 149. 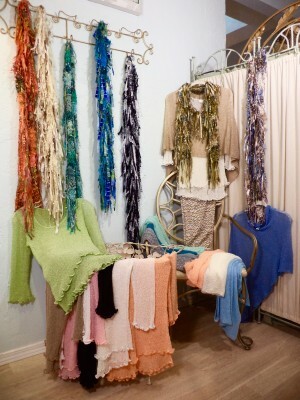 Complimentary Knit Shrug is variety of colors - 59. Handmade Ribbon Boa in Green Colors - 129. Tangerine Maxi Embroidered Skirt - 129. Multi- orange Handmade Ribbon Boa - 129. Long Tan Knit Vest - 99. 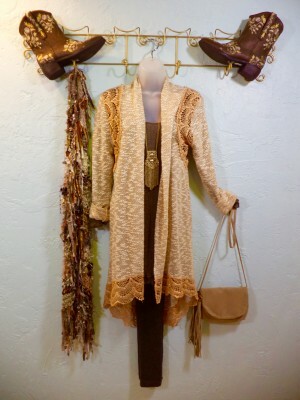 Multi tan/gold Ribbon Boa - 129. Grey knit Top - 59. Handmade Silk Shawl - 199. Black Maxi Skirt - 89. SOLD! 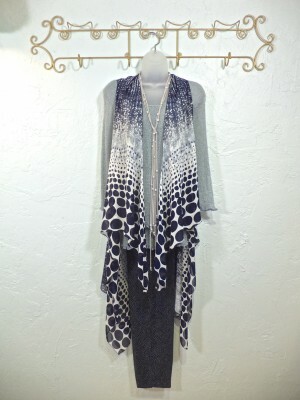 Animal Print Cardigan gray/black - 89. Tan Knit Lace Maxi Skirt - M, 129. Tan Layered Knit Top - 79. 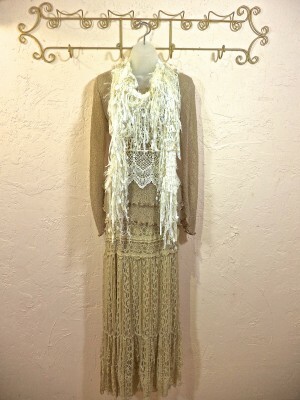 Ivory Lace Vest - 99. Ivory Ribbon Boa - 129. 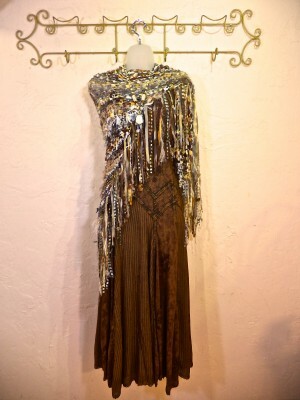 Bronze Maxi Dress, rayon - 149. 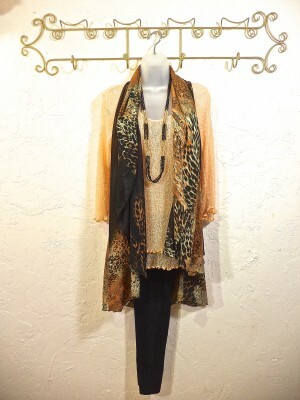 Handmade Ribbon Shawl in tans/browns/cream - 299. 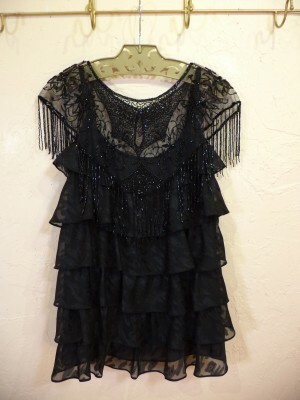 Black Layered Cami, M - 99. Lime Knit Layered Top - 79. Sage Maxi Skirt - 139. 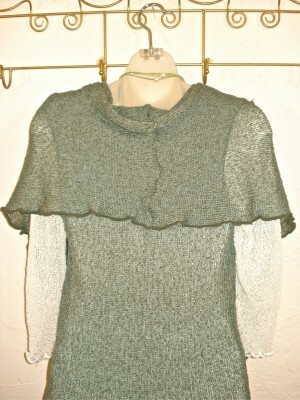 Citrus green layered knit top- 79. 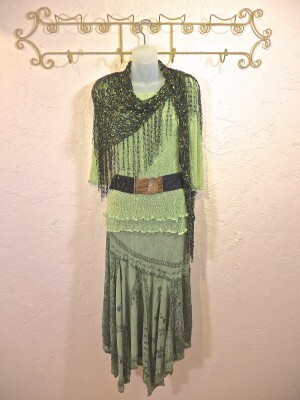 Beaded stretch belt in greens w/wooden closure - 49. Green Suede/Pearl Lariat w/ earring - 99. 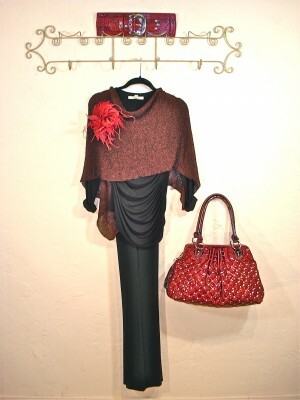 Mocha Knit Poncho - 59. Mocha Knit Skirt - 79.-SOLD! 1 size, asst. colors - 79. Sage knit vest, misc. colors, 89. Our handmade 3-strand suede w/large freshwater pearl, w/earring - 99. 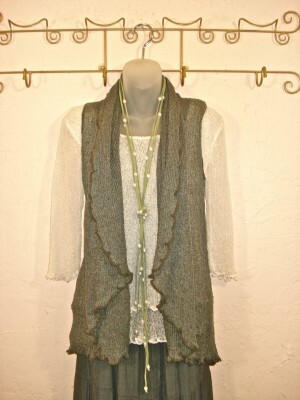 Many ways to wear this great vest....drop the collar and it works as a nice poncho. Another way to wear this great vest, drop the collar, then add a feather pin! Ivory knit layered top -79. Beaded stretch belt w/wooden closure - 49. Here's a pic of the back of the knit vest, when you drop the collar.